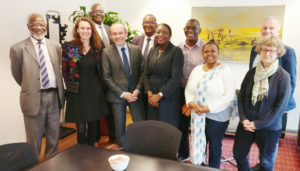 (Bern, Switzerland) As part of implementation of IHI’s key strategic objectives, Chief Executive Director (CED), Dr. Honorati Masanja, and Senior Research Scientist, Dr. Sally Mtenga, visited the State Secretariat of Education, Research and Innovation (SERI) in Bern. “We (Dr. Masanja and I) had a great opportunity to visit the State Secretariat of Education, Research and Innovation (SERI) in Bern. This was an honour to IHI and an opportunity to share our research portfolio, to highlight on our continued collaboration with Swiss TPH, and how we have been benefiting from this collaboration and from the Swiss agencies,” reports Dr. Mtenga. State Secretary Mauro Dell’Ambrogio heard from Dr. Masanja two key issues: the need to invest in non-communicable disease which is becoming an obvious burden to Tanzanian communities, and the need to retain competent scientists using the core funding. 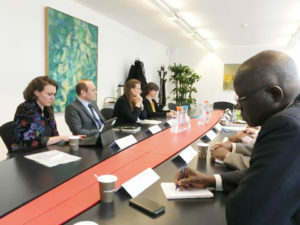 “I would say that the discussion was very successful, we were able to flag our institute and we were assured of further opportunities to meet with the Swiss state secretary directly as an institute where we could explore some potential funders who will be interested in supporting our core funding and NCD work at IHI,” notes Dr. Mtenga. Dr. Mtenga adds that she considers engagement an important milestone for IHI this year because strengthening engagement with key stakeholders, including funders, is number one objective in the Institute’s Strategic Plan 2018-2023. “We as an Institute are working hard to engage stakeholders at various levels. Most importantly, it is an entry point in which we could expand the scope of our partnership and funders,” she stresses.